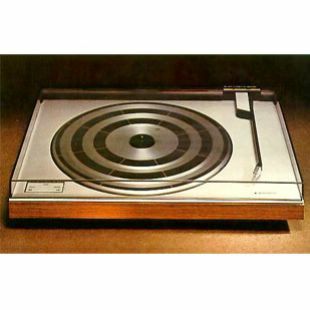 Beogram 1102 was a fully automatic, hi-fi stereo record player with electronic servo-drive and high specification level. Operation was easy and straightforward. All functions were controlled by pressing the rectangular operating panel and if dissatisfied with the pitch of the record, speed could be adjusted by depressing the panel and rotating the little thumbwheel. The pickup was an MMC 3000 with a spherical diamond. It tracked records at a stylus pressure of 1,2 grams. In order to fully exploit the pickup's outstanding qualities, B&O constructed an extremely light magnesium pickup arm which, together with its unique suspension, ensured low inertia and thereby good conditions for correct contact between stylus and both walls of the record groove - at all times. Even warped records could be played satisfactorily. Despite high specification levels, Beogram 1102 and 1902 automatic record-players are extremely easy to operate. All the technicalities are hidden under the surface. These decks are beautifully made and offer super sound quality for almost no money. Much easier to maintain than the tangential decks simply because they are very simple! Excellent isolation from external vibrations - strongly recommended - and they were when new by Hi-Fi Choice! Simpler than the earlier 1100 - and better for that! A DC motor replaced the AC motor fitted to the 1100 and was electronically regulated with speed adjustment done through a potentiometer as opposed to the complicated measures used in earlier decks. This method would roll out across the range of Beograms. Beoworld says: Superb deck - a real bargain. Good sound and suspension and modern clean styling. Highly recommended.